I got the text early Monday, a week before launching Voices of Monterey Bay. Have you heard from your aunt? my friend asked. Yesterday, why? I asked. The fires, he said. He texted me a news article about the firestorm that swept Sonoma and Napa counties the night before. Immediately I called my cousin Paul, who lives in Santa Rosa with my favorite aunt, Lucille. He called back minutes later. Police were driving down the street, ordering them to evacuate. ‘We have to go!” he yelled. “Come here,” I offered. “You can stay with me.” With me was four hours to the south. I did what you do. You take care of family, especially in a crisis. Still, I was overcome with… what was it? Fear. Yes, I was terrified they might lose their home. But I had other fears, very selfish ones. Not because two rather loud people would invade my very quiet house, not because there would be distractions the week I was jamming to get the Voices website up — not to mention my day job. No, none of those were concerns. What terrified me was the thought of spending so much time with the battlefield that was my aunt’s mind. She was evacuating a firestorm, but where could I escape to? I have come to learn that dementia runs in my family. Until Lucille got it, it seemed only to strike the men, and some of them at an early age. I, too, have one of the so-called Alzheimer’s genes. If I have two of these mutations, the research says, it can be really, really bad. One mutation is also not a great thing. My aunt’s version came on gradually over the years; it was hard to tell how much was just her personality on some kind of age-fueled overdrive and how much was actual dementia. Lucille was always what my Southern grandmother would call “onry.” Not “ornery” like some folks pronounce it — onry. 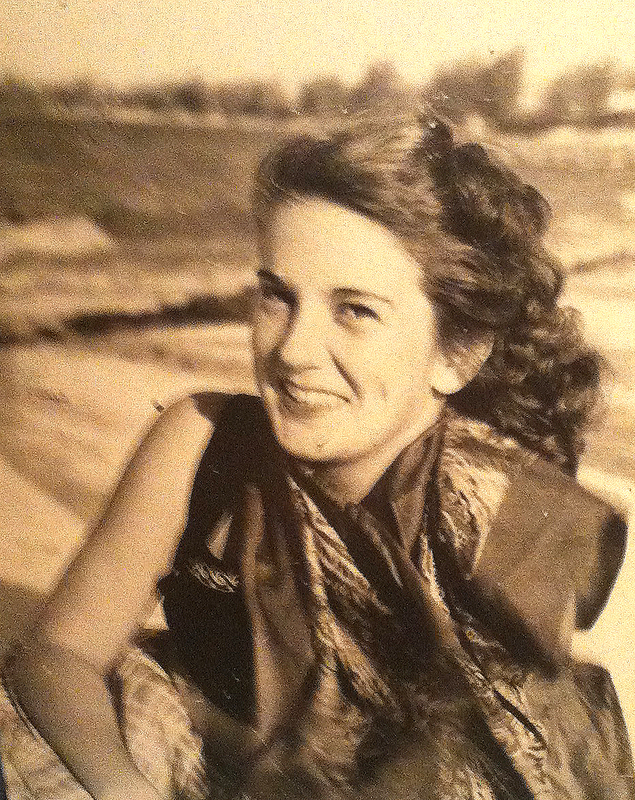 She was so onry, in fact, that she and my mother once refused to speak to one another for three years after a fight. So it wasn’t a shock that her way of becoming mentally impaired would involve argumentative spates of onriness, paranoia and plain rage. We were all trying to kill her, she’d rave, probably hiring hit men. We wanted her committed to an asylum, she’d rant, wanted the police to cart her off to jail. We all hated her. “Oh, don’t you deny it!” she’d spit. We could handle those tantrums. The sadness was far worse. I can’t recall how often I’ve held her at 2 a.m. as she sobbed, curled in the fetal position. “I can’t do this any more,” she’d whimper. “I just… can’t… do it.” She’d beg the universe — or somebody — to let her die, and then she’d beg me not to stop her. A few years back, I thought she was talking about suicide. I reminded her how much there was to live for. Didn’t we have fun mushroom hunting that very afternoon? Didn’t she love her garden and the baby quail that dug it up? I finally figured out she didn’t have suicide in her — she simply hoped to shrivel up and fade away. Her body, however, far fitter than her mind, wouldn’t cooperate. “Please, please, let me go,” she implored. I’d tell her I loved her, for an hour, or two hours, or three, holding her tight and though I knew her suffering was more immense than mine, I’d pray she’d finally exhaust herself and shut the hell up so I could get some goddamn sleep. During these events, however, her stamina seemed limitless. 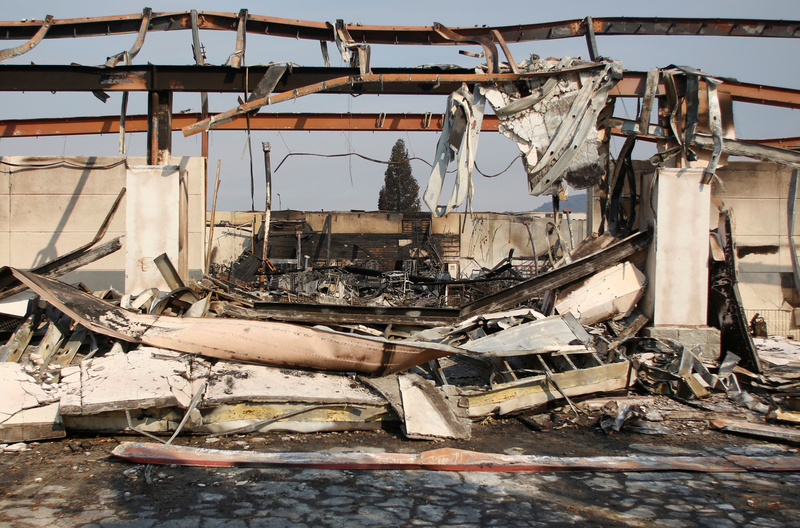 The remains of the K-Mart shopping center in Santa Rosa. Lucille and Paul arrived at my house Monday afternoon. She looked dazed, but not entirely out of it. “Imagine what it feels like to close your front door and not knowing if you’ll have a house when you come back,” she said. It was profound, and such a normal thing to say under the circumstances. It surprised me. She seemed like… herself. Her old self. Besides being onry, my aunt Lucille could be a lot of fun. To this day, she loves to laugh and can still lambast Trump and Congress with irony. She has been there for me my entire life — taking me in, no-questions-asked, after I was dumb enough to hitchhike across California at the age of 16 (it turned out to be a fabulous adventure). In my 40s, when my mother died, she and my uncle Marcello embraced me like the daughter they never had. I don’t care how old you are — when you’re orphaned you feel like you’re drifting in a rowboat with no oar. On my first birthday after my mom’s death, she and Marcello invited me to their spacious new home in Santa Rosa’s hoity-toity Fountaingrove neighborhood. The house was gorgeous. Marcello was an amateur architect and had a hand in its design. It was so freaking huge it had two living rooms. It also faced a golf course, so every now and then golf balls came careening into the side of house. Marcello collected them, plotting to one day throw them back at some unsuspecting golfer. The night of that first birthday without my mom, they made dinner and even wrapped silly presents for me. I never forgot this simple gesture; it felt like a lifeline tossed to my little rowboat. Later, when Marcello died, I took care of Lucille, honored to return the kindness. In the decade since, at least once a month, often twice, I’ve made the journey north to Santa Rosa to spend a few days with her. In the summer of 2011, we travelled to Oxford University together, to revel in wine, scholarship and literature. I noticed on that trip that she was starting to forget things. She’s slipped fast since then. You see those MRIs of people with dementia, the ones that look like the brain is full of holes. I often wonder where the holes are in her brain. Which pieces are missing? Yet as she and Paul tried to settle in at my house, she seemed surprisingly aware of what had happened. They had been evacuated because of a terrible fire. It came right up to the back of her house. She knew the general story, but couldn’t remember if the house had burned. 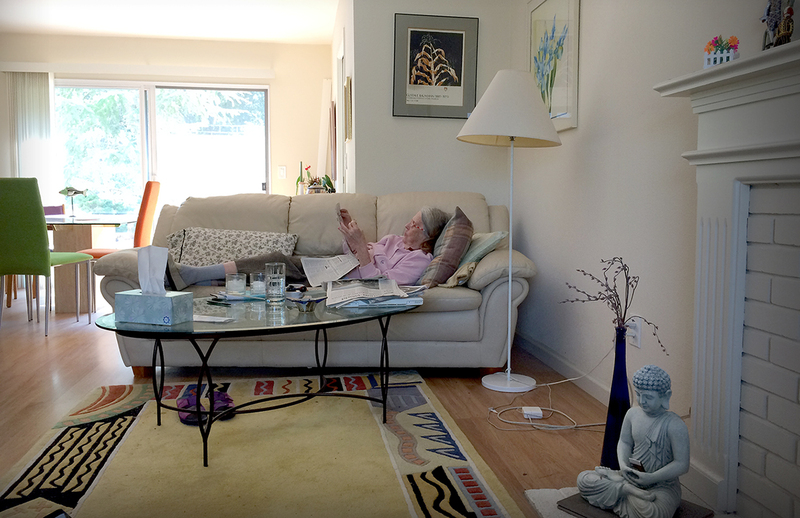 She no longer lived in Fountaingrove, having sold the big house and moved to more modest quarters in Oakmont, a 55-and-over “active living” community. It’s part of Santa Rosa but closer to Kenwood and Sonoma’s Valley of Moon. Her living room window framed a magnificent view of Hood Mountain. I called it “my mountain” and, during my visits, loved watching its color shift through the day from a cold green broodiness to a toasty gold and then dark again. Now all of Oakmont was under mandatory evacuation, and for days we watched the news like addicts, mainlining any information that might provide clues that her house was still there. She felt nauseous and was vomiting through it all. After three days of this, I ordered her off the couch and announced we were going to the doctor. She went along with it, which shocked me. I’d been trying to get her to a doctor for years and she wouldn’t budge, claiming doctors and hospitals make you sick. This was a mass migration. 100,000 people had evacuated the fire zones in Northern California, a number that’s nearly the population of Watsonville and Santa Cruz combined. But off we went to Kaiser’s Urgent Care clinic in Scotts Valley. The doctor was young and handsome and she told him so. My aunt can still be very funny when she wants to be. He chuckled and she was charmed enough to say she might even come back the next day. I noticed she told him she was 77 when she’s actually about to turn 88. He suspected her vomiting was related to the stress of the evacuation. A lot of North Bay folks were coming down to Santa Cruz County to stay with family, he said, and the clinic had seen a fair amount of them with anxiety-related maladies. Cal Fire said 100,000 people had evacuated the fire zones in Northern California, a number that’s nearly the population of Watsonville and Santa Cruz combined. This was a mass migration, as if entire cities were fanning across the region. The TV news was reporting that many evacuees were old, like my aunt. The doc’s good looks and anti-nausea meds seemed to work. Her mind, though, was a wreck. She kept forgetting where she was — You’re at my house, not yours in Santa Rosa, I’d say — and then she’d remark over and over that she wanted to go home. You can’t, we’d say, not yet. Sleep was not to be had for any of us. She spent the nights wandering the hall in search of the bathroom she’d just used. We tried to make the evacuation a cheerful event, with Paul grilling steak on the deck while Lucille and I guessed the answers for Jeopardy. She got a few right, and we had some laughs. But by nightfall she’d fall into that anger, first simmering and then boiling. They’d been with me eight days when the tension exploded into a full-scale battle. She insulted Paul and he, exhausted from the whole ordeal, took the bait. They yelled and cussed and I slipped outside to sit on the curb. I was bloody fuming. Furious at her and her stupid illogical reasoning that caused so much strife, furious at Paul for arguing back when there’s no point. Furious at myself for blaming her when she couldn’t help it. I stayed out there a long time, staring. No stars, just a smoky sky. The next morning, she apologized for behaving so badly. I was stunned — it had been years since she could remember anything that happened the night before. I accepted her apology. Maybe she wasn’t as far gone as I thought she was. At one o’clock on day nine, officials in Sonoma County lifted the evacuation of Oakmont. Paul danced while Lucille smiled. Hundreds, maybe thousands of firefighters had fought hard to save Oakmont’s 3,100 homes, and this time they won. Day nine was also the 28th anniversary of the Loma Prieta earthquake, and my sister-in-law and I shared a toast over FaceTime to commemorate that day when the lawn bucked like a roiling sea and downtown Santa Cruz became a cloud of dust. After that earthquake, we spent more than a week living in the yard between our houses and the experience shaped us for life. This time, we toasted to the end of the evacuation. My aunt’s house was safe and she could return to her comfort zone, her couch, her bathroom. Her home. The next day, we caravanned up the coast to Santa Rosa. As we crossed the city to get to Oakmont, we were struck by how ordinary it all looked. I knew from Loma Prieta as well as the ’85 Mexico City quake that when disaster strikes, huge swaths of a city can go on as usual, people resuming their routine lives: shopping, getting smog checks, sipping coffee in cafés. So it seemed with Santa Rosa, despite the fire trucks from across the West coming and going and the “We love you, first responders!” signs everywhere. In Oakmont, the only sign of the fires was the smell, a thin layer of white ash and the sight of Hood Mountain. Or rather, not the sight of it. My mountain was completely hidden behind a thick, soft blanket of smoke from the still-burning Oakmont Fire. The house looked fine. My aunt settled in and appeared content. I took a photo of her relaxing on the couch and texted it to friends, adding, “Happiness is being back home.” Paul cleaned out the fridge while I swept ash off the patio. I asked my aunt if she was glad to be home and she looked at me, perplexed. She had forgotten all about the past ten days.. When I mentioned the fire, she thought I was referring to the one in her fireplace. No, I said, the wildfires — the worst wildfires in California history! I recounted, several times, that she and Paul had fled those very fires, had endured the fear and the stress of being away from home. She didn’t seem to recall any of it. I told her again, this time with a cruel tone. Before I’d avoided too many details about the 40-plus lives lost and thousands of houses destroyed. Now I wanted her to feel it, to realize she’d been through something, that we’d been through it together. I told her the house she and Marcello had designed and built in Fountaingrove was gone, a fact I’d verified by looking at aerial maps. That almost all of Fountaingrove was gone except, oddly, the two houses on either side of her old one. I told her it was fortunate she’d sold that house and moved, a comment followed by a stab of guilt over the people who’d bought it. Paul, too, tried to recount our harrowing week and a half, but our descriptions had little effect. In her world, there was no fire and there never had been. I heard a man say on the radio that his neighborhood had only two colors now — white and black. Her comfort restored, her anger soon returned and I decided it was time to leave. 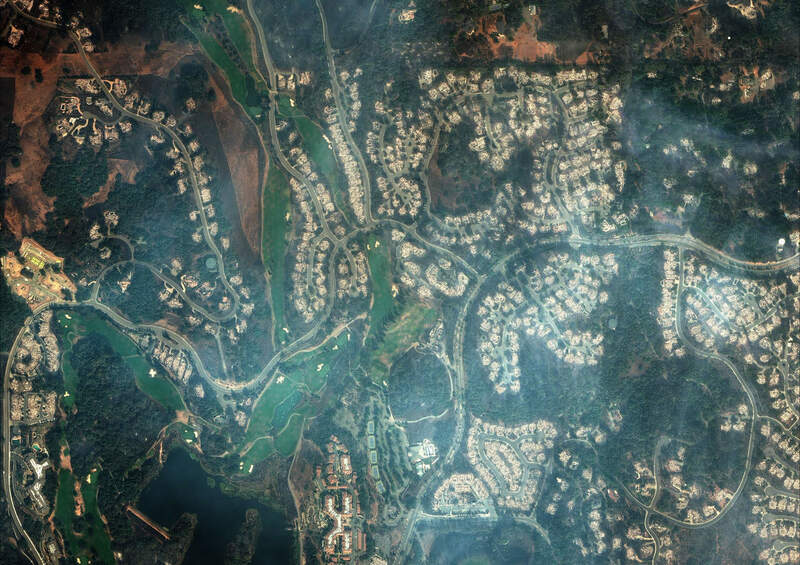 The Bear Fire was raging in the Santa Cruz Mountains, and I was concerned about my own home. As I turned the key in my car, I noticed the smoke blanket had abruptly cleared from Hood Mountain and the sky was blue. For a second I wondered if her version of reality was the correct one, that maybe there had truly never been a fire. I drove away feeling a sense of something lost, but couldn’t figure out what it was. Still, I wasn’t ready to leave Santa Rosa. The sky was darkening and the traffic grew heavy, but I wanted to go to the north side of town, where most of the fire damage was. That was where the entire neighborhood of Coffey Park had been leveled the first night, along with Fountaingrove. I asked myself if I was doing this because I was a crime reporter who always had to see things to believe them, or if it was just morbid curiosity. Probably the latter, I had to admit. I knew they wouldn’t let me into Fountaingrove, but I had to go there, follow that route I’d driven for years just to spend a weekend cooking, joking and savoring life with Lucille and Marcello. Men in camouflage — probably National Guardsmen — directed traffic at the corner of Fountaingrove Parkway and I saw a scorched hillside that was once the Hilton. I turned a corner. I saw a mangled stretch of what must have been storefronts. Then a burned-over parking lot and a mobile home park next to the Kaiser Permanente hospital. The sagging ruin of the K-mart where I’d bought many cheap shoes. It was impossible to imagine the terror experienced by those who’d been here. The color had washed away from these tangled, frozen scenes. As I headed south in the dark, I heard a man say on the radio that his neighborhood had only two colors now — white and black. He was right. I understood now why I needed to see this before I left town. I wanted to prove that my version of reality was the correct one. That, yes, there had been fires and they were terrible. But in the chaos of her mind, there was no reason to mark the occasion. Because nothing at all had happened. The truth I had to face was that the worst was, and is, far from over.